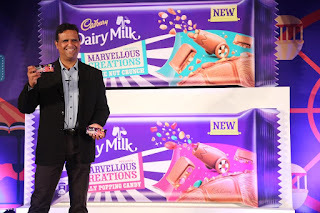 INDIA – August 2, 2016 – Mondelez India Foods Private Limited, today announced the launch of yet another exciting innovation – Cadbury Dairy Milk Marvellous Creations. After the successful launch of India’s first ‘centre-filled’ Chocolate – Cadbury Dairy Milk Silk Caramello and more recently India’s first ‘aerated’ Chocolate – Cadbury Dairy Milk Silk Bubbly, Mondelez India, the market leader in the chocolate category in India (as per Nielsen) brings its global product Cadbury Dairy Milk Marvellous Creations to India. Exuberating a fun and playful characteristic, this unique chocolate bar surprises consumers with its distinctive form and unpredictable inclusions. Cadbury Dairy Milk Marvellous Creations will be available in two flavours, Jelly Popping Candy and Cookie Nut Crunch, and will be manufactured at the company’s new manufacturing facility in Sri City, Andhra Pradesh. Strengthening its position as a market leader, Mondelez India redefines chocolate eating experience for its consumer that craves for innovation. Cadbury Dairy Milk Marvellous Creationsis anything but an ordinary chocolate. Even at first glance, Cadbury Dairy Milk Marvellous Creations is different, with a quirky looking block and curiously shaped pieces of varying sizes made specifically for sharing – introduced for the first time in India. The rounded pieces roll off the roof of your mouth, the chocolate melting away to leave the key ingredients to explode, as the contrasting sensations play off. The jelly beanies, gems and popping candy all infused in delightfully shaped bar, is what makes Cadbury Dairy Milk Marvellous Creations so marvelous! Brightly wrapped in distinctive purple candy stripes, the fun of Cadbury Dairy Milk Marvellous Creations also extends to the design of the packaging. Cadbury Dairy Milk is a brand that has transcended into everyday Indian life and it’s a brand that consumers love and trust. And through Cadbury Dairy Milk Marvellous Creations, the brand is amplifying the joy that it has been bringing to Indians for more than six decades. The launch of Cadbury Dairy Milk Marvellous Creations will be supported by a 360-degree communication campaign, that includes a new TVC, as well as outdoor & digital campaigns targeting the brands core target audience – ‘Framilies’ (Friends + Families). On-ground activations and a Cadbury Dairy Milk Marvellous Creations bus, are also a part of the campaign to leave its consumers pleasantly surprised. Cadbury Dairy Milk Marvellous Creations will be exclusively available in select cities, on Amazon, India’s largest online store, starting 10th August. It will then be available across all major urban and rural retailers from mid-August. With Jelly Popping Candy and Cookie Nut Crunch priced at Rs. 39 and Rs. 80, Cadbury Dairy Milk Marvellous Creations is all set to give chocolate lovers an unforgettable experience, leaving them wanting more! Mondelēz International, Inc. (NASDAQ:MDLZ) is a global snacking powerhouse, with 2015 net revenues of approximately $30 billion. Creating delicious moments of joy in 165 countries, Mondelēz International is a world leader in biscuits, chocolate, gum, candy and powdered beverages, with billion-dollar brands, such as Oreo, LU and Nabisco biscuits;Cadbury, Cadbury Dairy Milk and Milka chocolate; and Trident gum. Mondelēz International is a proud member of the Standard and Poor's 500, NASDAQ 100 and Dow Jones Sustainability Index. Visit www.mondelezinternational.com or follow us on Twitter at www.twitter.com/MDLZ. About Mondelez India Foods Private Ltd.
Mondelez India Foods Private Limited (formerly Cadbury India Ltd.) is a part of Mondelēz International, a world leader in biscuits, chocolate, gum, candy and powdered beverages. The company in India operates in four categories – chocolate, beverages, biscuits and candy and is chocolate category leader. Cadbury Dairy Milk, Cadbury Dairy Milk Silk, Cadbury Celebrations, Cadbury Bournville, Cadbury 5 Star, Cadbury Perk, Cadbury Gems, Cadbury Glow are some of the company’s chocolate brands in India. The company’s beverage portfolio consists ofBournvita and Tang. Cadbury Oreo & Bournvita Biscuit is a part of its biscuit portfolio and Hallsand Choclairs Gold make up its candy portfolio. For more information, please visit www.mondelezindiafoods.com.